» Best Bike Trainers For 2019 – New Models With Resistance Roller! Bike trainer help avid cyclists train for races, get some exercise in the comfort of their own homes during inclement weather and make it possible to get a great workout without leaving the house. Bike trainer should have sturdy construction, great warranties for factory workmanship and a great standing within the industry. Bike trainers work by elevating the rear wheel of your bike while maintaining its balance. This allows the rear wheel to spin freely when you pedal, but the front wheel remains stationary. You can shift gears, pedal as fast as you want and get a good workout without leaving the house. Add some enjoyment to this routine by purchasing special videos that take you on scenic tours along a bike path. That way, you can shift gears going up or down hill by following any directions given within the video. Before you know it, you have a 30-minute workout under your belt and all you did was ride your bike in your house for a little bit. You have several factors to consider when you purchase the best bike trainer on the market today. These things should all lend to how the trainer works with your bicycle at home. Obviously, you want a bike trainer made of sturdy materials so it can stand up to regular usage. Aluminum bike trainers are lighter in weight than steel varieties while maintaining structural integrity. However, both aluminum and steel alloys are the best materials for these devices. Metal should be sturdy, free of sharp edges and it should anchor the rear axle fairly well. A bike trainer isn’t lightweight. These devices weigh around 20 pounds, so expect to get a sturdy item when you receive your shipment from Amazon. The resistance roller should spin freely as the rear wheel moves. The roller is the part of the bike trainer that contacts the rear wheel of your bicycle. The roller should make you feel as if you are pedaling your bicycle normally at first. A good bike trainer allow you to adjust the tension of the resistance roller on the fly. Some bike trainers contain resistance roller controls that you operate from the handlebars. This makes it very easy to simulate terrain, although that’s why you have gear shifting on your bike. Resistance rollers should produce normal wear on your tires rather than creating extra wear. There are three main varieties of bike trainers on the market. The least expensive of these is a wind trainer, which uses the roller to turn fan blades in order to create wind resistance. Wind trainers are loud due to the moving fan blades. Magnetic trainers, or mag trainers, use magnets to operate an eddy current brake. This brake controls the resistance roller precisely. These trainers may have handlebar controls, and they are in the middle range in terms of price. Fluid trainers are the most expensive and quietest of the bike trainers. Liquid-filled chambers create resistance in the rollers. Most new bike trainers come with steel skewers. Steel skewers let your bike fit more securely in the clamp. This reduces possible accidents or injuries in case your bike slips off of the trainer. Steel skewers also help lessen the forces that may make the bike trainer wear out faster. You may have to change out the skewer on your rear axle at first, but once you get the hang of it there shouldn’t be many problems. Bike trainers are need to assemble easily. If possible, look over the instruction manual online before ordering a bike trainer so you can see how it fits together. Most bike trainers come with instructions that are easy to follow. The best ones have paper manuals and how-to videos you can find online. Even though bike trainers are somewhat heavy, once you assemble one they basically fit in a compact space. Set your bike trainer in the corner of a room or within your garage. If you have a little bit of space, the assembled bike trainer fits in it. Now that you know what to look for in a bike trainer, let’s get into reviews of the five best bike trainers on the market today. CycleOps represents one of the best manufacturers in the world when it comes to high-quality bike trainers. 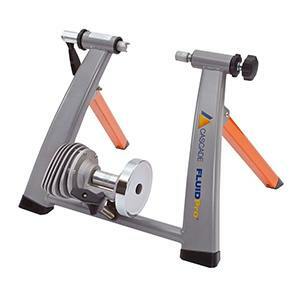 The Fluid2 indoor trainer is a top-of-the-line device made from durable 16-gauge steel that is two inches thick. The gadget is made from 100-percent recycled materials, and it won’t rust over time. 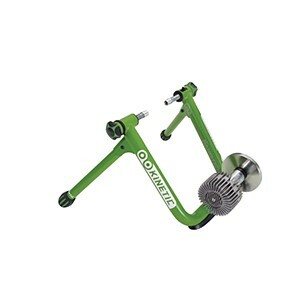 This is also one of the bestselling bike trainers sold on Amazon, with more than 100 reviews and a 4.5-star rating. A series of knobs make this easy to adjust and easy to take your bike on an off the assembly. Just tighten a few screws on either side of your bike’s axle and the bike trainer fits securely around the rear wheel. The resistance roller uses fluid to control how fast it spins, so you know you’re getting the best possible design. Adjust the resistance of the roller with a yellow knob behind the apparatus. This bike trainer comes with a precision flywheel. The flywheel allows for optimum operation as your bike wheel changes resistance due to gear shifts. The flywheel lets the 2-inch roller glide smoothly against your tire as if you were out on the road working out with your bicycle. The realistic feel is part of the draw of this trainer. Adjustable footpads let you balance this bike trainer on flat surfaces. These footpads adjust with a quick turn or two. Stable footpads are vital to how a bicycle trainer works because they stabilize the device without destroying your floor. You might put some thin pieces of carpet underneath the pad if you have a hardwood floor or tiles. That way, you minimize the damage to your flooring. CycleOps warranties this product for as long as you own it. Several owners of this bike trainer say that when the resistance roller breaks down, the company sends them a new one without question and at no charge. One customer said this happened after owning the bike trainer for three years, and that the customer service staffer was very responsive to the broken roller. In the case of this product, you definitely get what you pay for thanks to this lifetime warranty. Owners love the quiet operation of this bike trainer. That’s because of the fluid-based mechanism that drives the roller. Fluid-based mechanisms are also the most expensive bike trainers on the market, but the quiet operation lets you hear the television, your cellphone or your kids in the next room. The quiet operation means you can focus on other things that you may need to tend to in the middle of your workout. CycleOps definitely has a winner with its Fluid2 bike trainer. You can see a video of its operation here, and you can get a how-to video from this source here. You need tools to assemble this hardware, as is the case with many of these devices. For best results, get a socket wrench and vise grips to tighten everything. Some owners find the illustrated instructions confusing, which is why how-to videos come in handy. Overall, this is a fantastic machine for training on your bike. There usually aren’t any problems. Where there are difficulties, customer service steps in and rectifies the problem either through repair or replacement. This magnet steel bike trainer folds up for easy storage and transport. All you need is a corner of a room, or even a trunk, and you have a place to store this gadget. The heavy-duty steel construction means it holds up to most riding conditions, whether you go out for a leisurely jaunt on flat terrain or a hard, uphill climb in the comfort of your own home. As a mag trainer, this is mid-range in price and in the middle with regards to quiet machinery. The bike trainer has five resistance settings so you can customize how hard you want to work. If you keep it on the easiest resistance setting, you let the bike do all of the work for you. On the hardest resistance setting, get ready to sweat. The resistance increases as speed increases, so this machine mimics what happens as you pedal uphill. The high-tech magnets in the rollers are what cause the resistance to change. Change the resistance settings from controls attached to your bike’s handlebars. There’s no stopping your routine, getting off the bike and changing the resistance by hand. You can turn the adjustment knob manually if you want to, but the handlebar controls are much easier to manage. Rather than change gears on your bike, just change the resistance of the roller. Customers say this bike trainer operates quiet enough to hear the television while pedaling hard. Feel free to turn down the music on your TV or radio, or have one ear free while listening to music with earbuds. The resistance rollers won’t drown out your ringing phone, either. This bike trainer gives you the freedom to train as you choose while maintaining an alertness towards your surroundings. One major plus of this bike trainer is the portability of the device. It does weigh 20 pounds, but it also folds up into a compact design. Set it up against a wall in your workout room, put in your garage or hang it on sturdy, wall-mounted hangers. Your storage options are endless when it comes to this trainer. Adjust for tire widths between depending on if you have a street bike or mountain bike. This trainer can handle 26- or 27-inch wheels as well as 700c wheels. The flexibility lets you have complete control of your experience, plus this works for a household that has more than one bicycle. If someone has another size of tire, all it takes is a quick adjustment before using it. If you want a tough, study bike trainer with a good price, this model is for you. There’s solid steel for durability and easy controls from the handlebars. You might have to order a mounting block for the front tire to make things more level because the bike trainer is somewhat high off the ground. If you don’t want to get a block, just use a few books. RAD Cycle Products’ version of a magnetic bike trainer contains a wide angle between struts for better stability on the floor, The two back arms are wider than the front ones to help take the load off of the center and to support the thick back wheel. This item looks sturdy from the moment you take it out of the package. You can ride this trainer with minutes of getting it out of the package. The rear struts are thicker, which means the manufacturer can make this out of lighter weight materials. The distance between the rear legs and front legs covers at least three-fourths of the diameter of your tire, so you get a very stable product once you set it up properly. The struts lock in place and remain that way until you fold it up. Like the previous model in this review, RAD’s magnetic resistance trainer folds up for easy storage. It virtually lays flat in similar fashion to an ironing board. Store this under a bed, behind a door, in closet, against the wall or hang it on a wall with sturdy hooks. Whether you keep this in the house or in the garage, this bicycle trainer disappears when you’re not using it. All you do is replace the rear axle with the one provided. Set up takes 10 minutes and you’re ready to go with whatever racing simulation you want on your television. Because setting this up is so easy, you can move this trainer to any room in the house. Turn the knob below the resistance rollers to increase resistance against the wheel. The wheel turns quite a ways, so you have varying levels of resistance from extremely easy to very, very difficult. If you don’t want to change the resistance wheel settings, simply shift gears on your bike to get a good workout. This model is quieter than ones that don’t use fans. However, this magnetic bike trainer can be loud enough to dampen any conversations you feel like having with someone else in the room. In other words, get ready to focus on your workout when you bring this baby out from the wall. RAD wins high marks durability, portability and a quality product. You get what you pay for because this mid-range price is higher compared to other models. However, the better construction led to a lighter weight and portable product. Instead of 20 to 21 pounds like other bike trainers, this one weighs just 17 pounds. It’s just three pounds, but that can make a difference as you set up and take down this trainer. If you are a beginner cyclist and you need a little extra help working out, this trainer is for you. It has no-nonsense controls and it stores easily in your home. 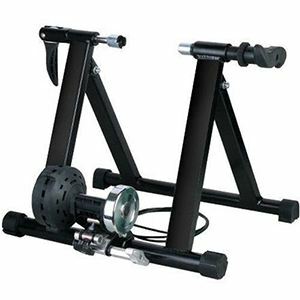 Cascade Health and Fitness has its Fluidpro bike trainer for sale as a top-of-the-line machine. The wide rear struts make for a stable configuration, while the front ones are skinnier. Cascade Health and Fitness warranties this product for a lifetime, so you get coverage for many types of workmanship issue for as long as you own this item. The flywheel is heavier to give the resistance roller better performance. The flywheel may stick out like a bigger wheel on the back of the product, but you get durable construction with this model because of it. Once you get the package, unfold the legs and attach your bicycle. There is no assembly required. You can have an indoor trainer in just minutes from its arrival at your house. This product is heavy--it weighs 37 pounds. At least you know it’s not going anywhere. The manufacturer coats the metal with industrial powder to prevent corrosion after years of use. In the factory, precise machines weld each piece together. Machines are more accurate and produce better results versus human welders. The resistance roller gets progressively harder as you pedal and increase gears. This leads to a smooth ride without a lot of abrupt changes in how you pedal. As you pedal faster and get into higher gears, the resistance increases. When you switch gears or pedal harder, you know what to expect without any surprises on this trainer. This unit folds up for easy storage. Don’t try hanging it on the wall, though. This beast weighs twice as much as other models. However, this durability means it lasts a lifetime. Take advantage of RAD’s lifetime warranty. This is one of the best bike trainers you can buy simply because it has everything you need to train well. You can set this device up in minutes, it’s very heavy to manage just about any kind of weight, the struts are thick and it folds up for easy storage. 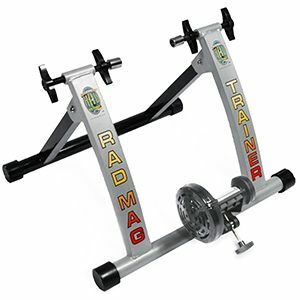 RAD’s fluid trainer has a quick-release axle do you can remove the bike quickly and efficiently after your workout. Yes, this model is expensive, but it’s worth the price due to the lifetime warranty, customer support and sturdy build. Kinetic’s Road Machine 2.0 fluid trainer is another top model in the hunt for the best bike trainer. This sturdy device weighs 25 pounds, so it has better storage options than RAD’s fluid trainer. This model is whisper-quiet, and it re-creates road driving effortlessly. These are just the beginning of the fine features of this bike trainer. Kinetic claims this item is 100-percent leak-proof. The company backs up with claim with a lifetime warranty against such defects. Kinetic also says this is the most reliable trainer made, and the customer reviews on Amazon back up this assertion with 4.7 out of 5 stars over 181 rates. This item arrives at your door already assembled. All you have to do is unfold the front struts, attach your bike and you’re ready to go in minutes. This model comes with a front riser. Kinetic’s fluid trainer fits bike tires from 22 to 29 inches in diameter. That’s pretty much any kind of bike you think of, from street tires to mountain treads. Most customers recommend going with street tires or specially made tires without treads to prevent wear on your main bicycle tires. For a little extra, add a wireless health monitor to your wrist so you can monitor your heart rate while you exercise. All of the information goes to an app you download to your smartphone. Working out on a bike has never been easier. As with most fluid trainers, this one gets progressively harder to pedal as you go faster. The proprietary flywheel doesn’t leak, but it has a dual magnetic and fluid system that keeps the progressive resistance intact after hundreds of miles of use. Remember, if anything breaks, just call customer service and they will take care of you. Like the other two fluid trainers in this review, Kinetic’s model is also one of the viable option you can choose from. Add-ons, such as the fitness training device, are a nice plus to this system. Keep in mind that, as with anything in life, your level of commitment mirrors your success. 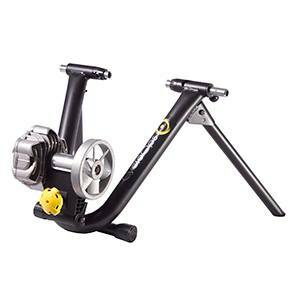 If you are serious about bike training, Kinetic’s fluid trainer is definitely a good start.